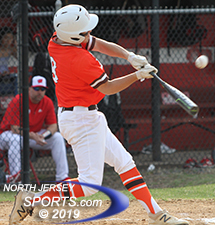 Marc Hernandez's two-out single with the bases empty in the top of the sixth inning started the two-run rally that Pascack Hills needed to squeak by Westwood, 2-1, on the road on Monday afternoon. WASHINGTON TOWNSHIP – Pascack Hills is the “defending” everything…the defending league champion, defending county champion, the defending state sectional champion, defending Group 2 state champion and the team that finished ranked No. 1 in New Jersey after the dream season that was 2018. Rarely, if ever, has a public school team had such a productive season and, better still, most of the players that made it happen last year are back again for another run. While all of that is the good news, the other side of it is that every game the Cowboys play this season, especially on the road, will almost be the equivalent of a World Series Game 7 for their opponent. 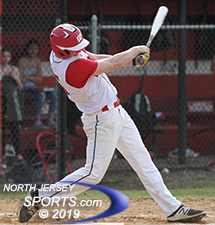 Knocking off the team that rolled through New Jersey High School baseball last season would be a the ultimate confidence builder and a potential season-maker and Westwood stepped up to take its shot on Monday afternoon on its home field. 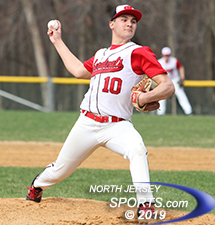 By varying his pitches’ speeds and their trajectory and by pounding the strike zone right from the opening inning, Westwood starter Anthony Carrubia put his team in position to pull an upset and kept it there for the duration of the game. Westwood took a one-run lead in the bottom of the second inning and clung to it all the way into the top of the sixth when Ryan Ramsey’s opposite field single that proceeded to elude the outfielder poised to field it pushed across both run that Pascack Hills needed to escape with a 2-1 win that pushes the Cowboys to 4-0 on the season. Steve Riedel's two-out double in the bottom of the second inning gave Westwood a 1-0 lead. Ramsey did his damage with bat from the right-hand hitter’s batter’s box, but dominated from the mound with his left arm. The senior southpaw who is committed to the University of Maryland and was pitching in front of a pro scout from the Texas Rangers, went six strong innings. Ramsey (6 IP, 1 R, 1 ER, 3 H, 10 K, 2 BB) knows that the Cowboys are going to get every opponent's ‘A’ game and welcomes the challenge. The win was also No. 100 for Pascack Hills head coach Kevin Kirkby, who clocked in with that milestone victory two days after his wife Erin, the head softball coach at Pascack Hills, won her 100th game on Saturday. Friday’s rainout made Kevin Kirby an also-ran in his own household. Chris Curcio struck out all three hitters that he faced to pick up his third save in as many appearances for Pascack Hills this season. 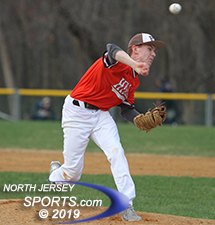 With his buffet of breaking pitches and well-placed fastballs, Carrubia (7 IP, 2 R, 1 ER, 5 H, 2 K, 2 BB) was able to keep the ball off the barrel of the Pascack Hills bats. He struck out only two, both of them in the first inning, but used the dimensions of his home ballpark and the steady defense behind him to full advantage. Carrubia induced 14 outs of the flyball, line drive or pop-up variety and his centerfielder, Dylan Cipolla, was especially busy. Cipolla made seven putouts, the best of which saved a run in the top of the third inning when he chased down Chris Curcio’s towering shot with a lunge and roll into the left centerfield gap. Westwood (3-1) had the lead when Cipolla made that catch because of a run it scratched out in the bottom of the second inning. With one out Kevin Ranoff was hit by a two-strike pitch and stole second to get into scoring position for Steve Riedel, the senior three-sport standout and the Cardinals’ No. 8 hitter, who smoked a double to deep right field. The two-out RBI gave Westwood the lead that Carrubia was able to nurse well into the later innings. Carrubia pitched to just one batter over the minimum in each of the first five innings and got the first two outs of the sixth on two harmless flyballs before catcher Marc Hernandez came through with a single back through the middle. Christian Kim, one of just three new starters in the Pascack Hills lineup, drew a walk in front of Ramsey, who then shot a line drive into right field that would have scored the tying run, but the Cowboys got a bonus when the ball took a tough hop and skipped to the fence, which allowed the eventual winning run to touch the plate also. Ramsey worked around a leadoff single by JJ Beites, who pieced together a quality at bat, by strike out two of the next three hitters in the bottom of the sixth, Carrubia worked around a two-out walk in the top of the seventh to keep his team right there, but Curcio took over on the hill in the bottom of the seventh. Anthony Carrubia went the distance on a 5-hitter for Westwood, which is now 3-1 on the season. Pascack Hills’ starting senior shortstop who threw less than 10 innings all of last year because of the depth in the 2018 pitching staff, Curcio has taken over as the Cowboys’ closer and he has been brilliant. He struck out all three hitters he faced in the bottom of the seventh inning and froze all of them with called strike threes. He threw a yakker of a curveball to get the second out and, against the final hitter, he just missed with a 2-2 curveball then had the hitter tied in knots when he ended the game with straight heat. While Pascack Hills’ graduation losses were few, they were impactful. Gone are two important pieces in starting pitcher/outfielder Jack Brodsky (Elon University), who dominated the state tournament in each of the last two seasons, and first baseman/relief pitcher Paul Sullivan (Iona). With senior Brandon Siegenthaler, the Villanova commit and last year’s closer, sliding back into the rotation, Curcio is key at the back end. He has been up to the task so far with three saves in three appearances and eight strikeouts and 3 1/13 innings. Pascack Hills’ early success is no surprise and it figures to continue unabated as long as the Cowboys stay healthy. Westwood has opened some eyes with its solid start and the fact that it was not thrilled by staying close to the defending state champions speaks to the Cardinals’ raised expectations for this season. FOR MORE PHOTOS FROM THIS EVENT PLEASE CLICK HERE. TO BUY A COLLECTOR'S PRINT OF THIS STORY PLEASE VISIT 4-FeetGrafix.com.